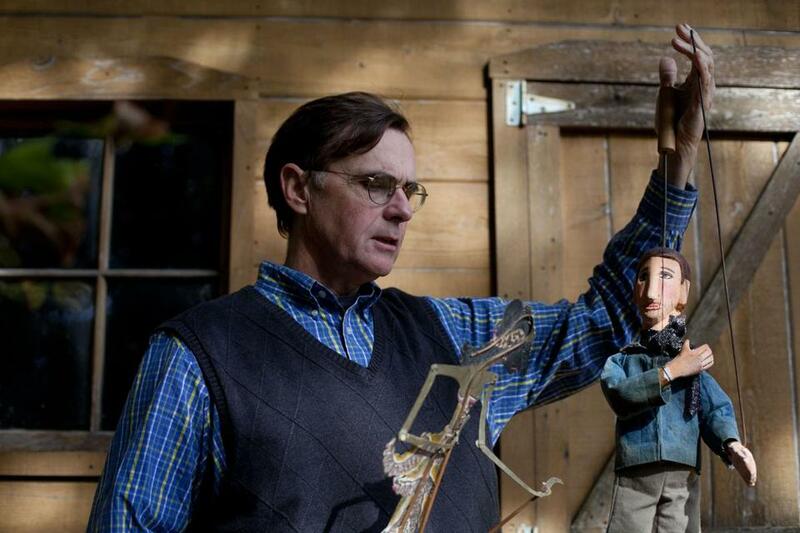 John Bell, a visiting theater professor at Boston College, hopes a December 2 festival will help spread his love of puppets. John Bell poses in his Cambridge backyard with two of his puppets. I grew up watching television, so I saw Kukla, Fran and Ollie and Howdy Doody. I liked to act and sing, and in college I started to perform. But I WAS A TERRIBLE ACTOR, and I think the focus on my own person was sort of a problem for me. And at that time, I saw Bread and Puppet Theater, and I saw this was a way of making theater, but instead of focusing on yourself, you could focus on this object and make it move. PUPPETRY IS PERFORMANCE that involves the focus of the performer and the audience both being on this material object, which can be sculpted to represent Punch or Kermit or Elmo or a Shalako puppet from the Zuni people or whatever. In Occupy Wall Street, they had a puppet of the STATUE OF LIBERTY. Bringing that super-important American symbol into the middle of the gathering was an attempt to say, “Hey, what we’re doing is as American as the Statue of Liberty.” IT’S A SIMPLE OBJECT, but the ideas connected to it and the context in which it’s placed make it a pretty complicated means of performance. The idea of the festival is to bring together a variety of different types of contemporary puppetry — it’s called PUPPETS! AN EVENING OF UNCOMMON THEATER [it’s free, but reservations are required; e-mail theatre@bc.edu]. I’m hoping that the audience sees the different ways performers today use puppets to articulate really interesting ideas, things that can’t be done with actors.